Like all fruit trees, peach wood falls into the hardwood category. Hardwoods are recommended for use as firewood and as smoking wood, simply because they do not have the resins found in pine and other softwoods. The smoke produced by those resins negatively affects flavor and can pose health hazards due to the carcinogens it contains. In contrast, seasoned hardwoods like the wood used to make peach wood chips will burn clean with no residue. That smoke is light and pale blue, not thick and sooty like the smoke from some softwoods. Which tree provides peach wood chips? The peach tree that grows in the US has its roots in Asia. Prunus persica is its Latin name and it comes from Northwest China. This tree is known for the delicate, juicy fruit that it bears as well as for its wood. Peach wood has many uses and is traditionally used for making furniture in addition to being a good firewood. Georgia is a state that is traditionally associated with peach cultivation with over 2 million peach trees and is also one of the places where barbecue with peach wood is most popular. Barbecue celebrity Myron Mixon counts peach wood from Georgia as one of the secrets to good smoking. 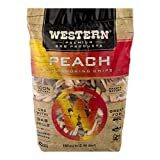 Peach wood chip flavor—how does its smoke affect the taste of food? What makes it unique? Peach wood chips are known for their distinctive fruity sweetness. Like apple wood and other fruit tree woods, the flavor from peach wood chips is mild. It works best when you combine it with wood that has a more assertive smoke flavor such as hickory. The combination of peach and hickory is an effective one as it sweetens the hickory smoke (which has the potential to be bitter) and adds the fruity notes of peach. Peach wood can also be effective when combined with other mild fruit woods for use on milder-flavored foods. 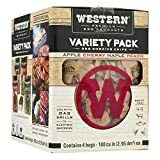 Does peach wood pair better with some foods than with other? Like apple and pear woods, peach wood is considered perfect for milder meats like pork and poultry. They allow its sweetness to shine since their flavors are relatively subtle. In addition, some cooks think that it works well with seafood. 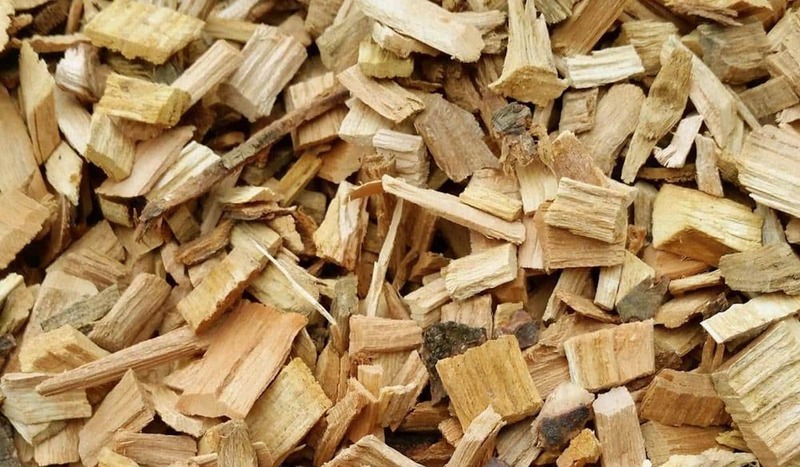 What is the best way to use peach wood chips? Use peach tree wood chips as you would any other fruit wood. Place them in a smoker box and put the box on smoldering charcoals or over a burner if you are using a gas grill. If you don’t have a smoker box, just wrap the chips in aluminum foil. Poke some holes in the foil before placing it in your grill. Soaking chips are often recommended, but most experienced barbecue cooks say that you shouldn’t bother. All soaking does is postpone the burning for a few minutes as the wood chips dry out; it does not make them burn at a slower rate as some people claim. When smoking with peach wood chips, you will need to keep one of this wood’s distinctive characteristics in mind—it loses flavor quickly after being placed on the fire. To ensure that your food gets as much flavor as possible from peach wood smoke, have it on the grill grates when you add the chips or put it there right after.